On the 2nd of March, RDF Wadlakonda School celebrated a different kind of day – Self Governing Day. Students of class 7, 8 and 9 took on the role of teachers. Interested students gave their names for this day, and the teachers chose the best student for the role. Kumari A. Shylaja from class 9 acted as the Headmaster and M. Raju from class 8 acted as MEO (Mondal Education Officer). It was an interesting exercise for students to understand how the school functions. This also builds a sense of appreciation and respect for the hard task the teachers do every day. 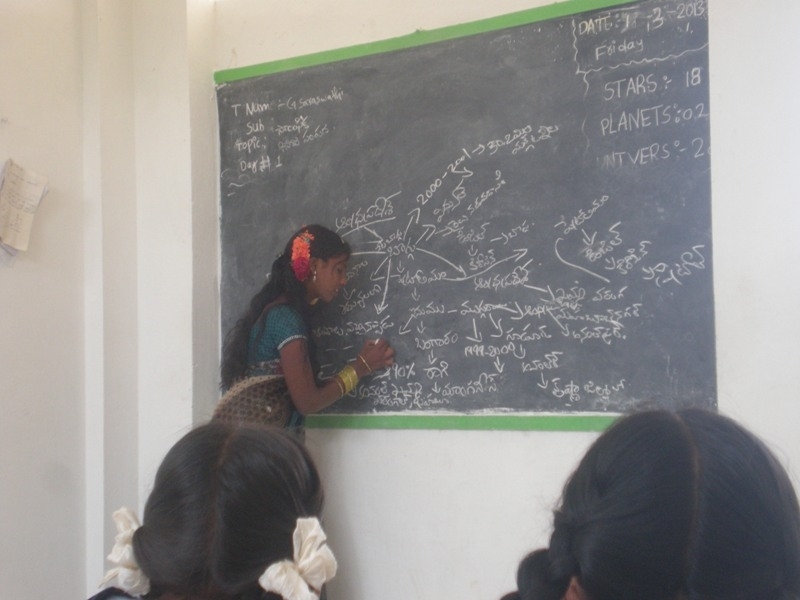 K. Sruthi (class 8), A. Shylaja and E. Shireesha (class 9) were appreciated as the best student-teachers for the day. 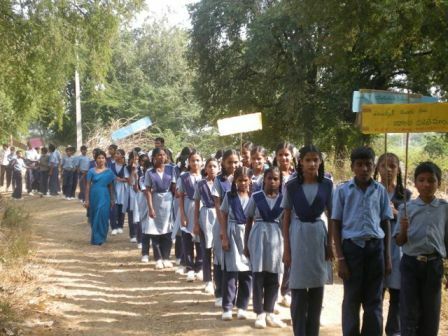 The students of RDF Wadlakonda School undertook a rally in the village of Wadlakonda to spread awareness about HIV-AIDS. Students not only held placards and shouted slogans but also took the time to explain the prevention of AIDs to the villagers. They disseminated health tips, key messages and even gave speeches during the rally. This was undertaken as a part of the Social Awareness Programme (SAP) which runs in all RDF schools. We commend their effort and hope that this will go a long way in the village. Students casting their vote at the mock elections. RDF Wadlakonda School organized mock elections to introduce the students to the concept of elections before they have reached the official voting age. This would help students understand the election process, the power of the democratic vote and be thoroughly prepared when it comes time to cast the crucial vote for parliamentary elections. Secondary school students and teachers participated in the elections. Through this process students elected their School Pupil Leader. Eight students contested in the elections and M.Raju from class 8th was elected as the School Pupil Leader, while K. Sruthi also from class 8th was elected as the Assistant School Pupil Leader. The elections have given the participants an understanding of democracy, the role of government and parliament. The experience of the mock elections plays a role in stimulating future young voters to cast their ballot. RDF Wadlakonda School Headmaster, Ch. Cheralu participated in a training program conducted by Gray Matters in Hyderabad specifically for Headmasters. This was a great opportunity for rural schools, as it not only enhanced the skill and information set of the attendees but Gray Matters guidance and rural specific focus was able to boost the confidence of the Headmaster in initiating and managing educational change. For instance, class management skills were taught, which included ways to make an ideal classroom environment and foster engaging teacher-student interaction. Topics also included the introduction of new methods of learning which make the time children spend in school meaningful. All in all it served as a great opportunity for headmasters to further develop the school. M. Venkanna a class 6th student at RDF Wadlakonda School flexed his creative muscle and came up with a magical performance for this fellow students and teachers. Assisted by C.H. Ramesh, the two of them used a simple pen and lit up one end of it. A few seconds later the fire was extinguished and there were a string of balloons emerging from the end of the pen. The two used a combination of science creativity to put up this truly magical performance. RDF firmly believes in conservation and ensures that all resources are used optimally. This enables the preservation of the environment and is also cost effective. 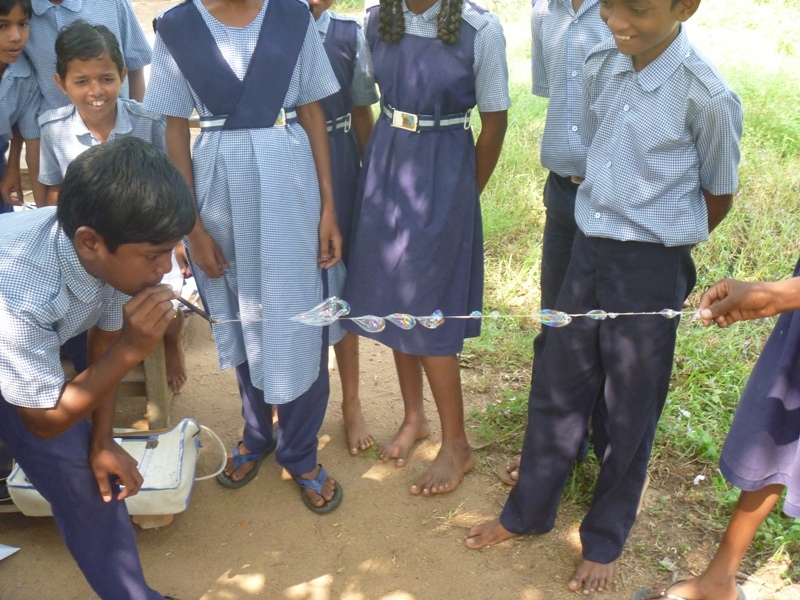 RDF Wadlakonda School had a ‘crafty’ idea which enabled them to carry this message further. Teachers and students from the school created handicrafts from waste material such as empty coconut oil tins, broken bangles, old x-ray sheets and even old woolen thread. With these seemingly useless materials, they were able to create a range of items which included flower vases, door and wall hangings, pen cases and bags. 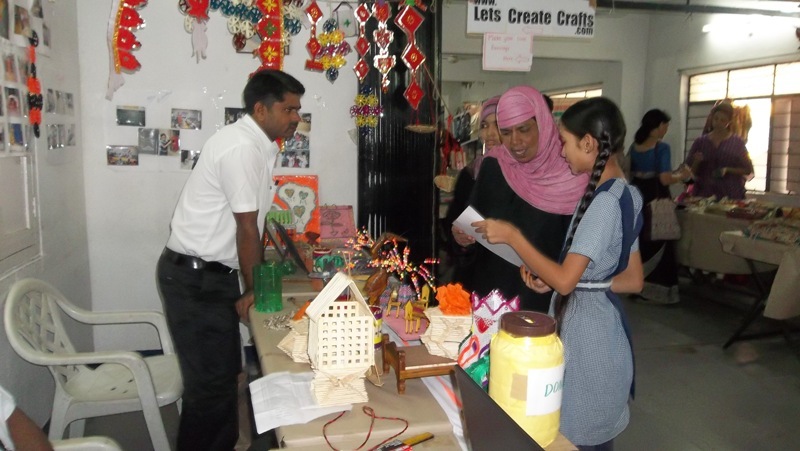 The items were displayed in a stall hosted by the school at a ‘Craft Mela’ (Craft Fair) organized by the YWCA in Secunderabad (Andhra Pradesh). The stall drew a lot of interest and praise, it also enabled the students and teachers to exchange ideas on creating crafts from waste material as well helped further the message of conservation. 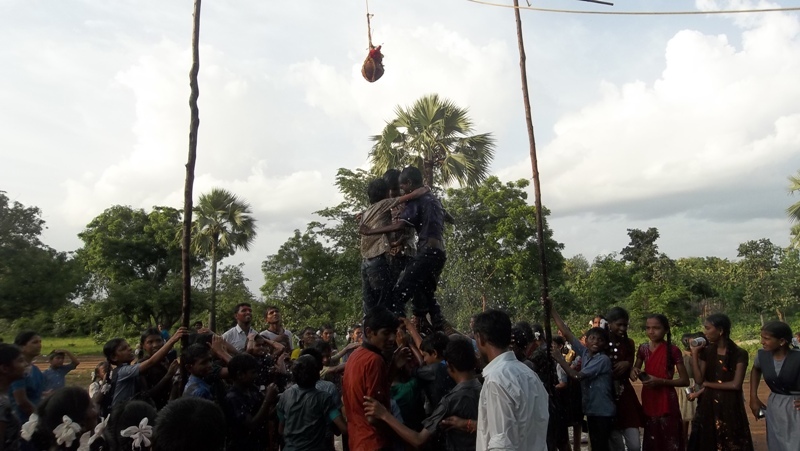 Around this time every year, the Indian landscape is dotted with human pyramids and tiny kids scaling to the top in order to break the coveted ‘dahi handi’ or ‘utti kottuta ‘ a pot filled with curd to celebrate Lord Krishna’s birth – Janmashtami. RDF Wadlakonda School got in the festive spirit and not only built the human pyramid consisting of students but also held a small program to teach students the relevance of the day. Teachers, students and even families participated in the annual event. This year, the students were also taught a few lines from the holy book; the Bhagvadgeeta in order to infuse some tradition and culture along with the fun and games. The celebration was a smashing success and we hope the students scale similar heights in their academic lives too.